And what I say is not altogether without foundation, since, if I may venture to speak of that which is most sacred in our eyes in the same breath with the errors of the ancients, we find that Truth has spoken to men in parables; and is the parable anything else than a fable? that is to say, a feigned example of some truth, which has by so much the more force and effect as it is the more common and familiar? Ce que je dis n’est pas tout à fait sans fondement puisque, s’il m’est permis de mêler ce que nous avons de plus sacré parmi les erreurs du paganisme, nous voyons que la Vérité a parlé aux hommes par paraboles; et la parabole est-elle autre chose que l’apologue, c’est-à-dire un exemple fabuleux, et qui s’insinue avec d’autant plus de facilité et d’effet qu’il est plus commun et plus familier? The Parable of the Prodigal Son does resemble a fable. Its narrative is “the more common and familiar.” However, despite a “more common and familiar,” exemplum, it tells the otherwise ineffable. How does one speak of love unconditional and forgiveness, which is at the core of Jesus of Nazareth’s teachings? In The Parable of the Prodigal Son, one of two brothers asks to be given his half of his father’s estate. This son then leaves home, squanders his money foolishly, and is reduced to starvation when a famine occurs. He therefore returns to his father’s home, saying that he has sinned. The love that brother has for brother. A journey long, over land and lake. Deux Pigeons s’aimaient d’amour tendre. However, La Fontaine’s pigeon was merely tired of “scenes domestic,” which is not a sin. He suffers the consequences he was told he would suffer, except that the dreaded falcons are an eagle and that children are “pitiless” human beings who try to harm our traveller. The falcons [faucons], nets Alas, it rains! To a large extent, the moral of The Two Pigeons is embedded in the story or exemplum. Yet, early in his fable, La Fontaine inserts a proverb, a genre that does not require a narrative or exemplum. Proverbs are related to fables and parables, but they are short, as are maxims. La Rochefoucauld wrote maxims. Your heart may bear, but me it kills. and his fable features modulations and transpositions, as in music. He writes “variations” on the theme of love. The segment I quoted in my last post expresses romantic love. Ah, happy lovers, would you roam? Moreover, although both our pigeons and the prodigal son have been fools, the prodigal son has sinned: “I have sinned against heaven and against you” (Luke 15:11-32), which suggests a gradation among exempla (pl.). When both pigeons are reunited, they rejoice, pigeons are pigeons, but the prodigal son confesses: “I have sinned” (Luke 15:11-32). The Parable of the Prodigal Son features two sons, one of whom, the “good” brother, is rather miffed because his father celebrates his prodigal brother’s (the “bad” brother) return. The parable has three figures, one of whom, the father, is a wise and Christic figure, and tells the ineffable. Given that one son is miffed, La Fontaine may have been inspired by the Biblical enemy brothers or Cain and Abel, sons born to Adam and Eve, one of whom, Cain, kills his brother, Abel. (See Cain and Abel, Sophocles’ Antigone, Jean Racine’s La Thébaïde, and Jean Anouilh’s Antigone, Wikipedia.) Were it not for a wise father, the prodigal son’s brother, or “good” son, may have harboured resentment. But La Fontaine’s fable’s dramatis personae consists of two, not three, figures: Les Deux Pigeons. Fables and parables also describes sermons. The word exemplum is usually associated with the sermons of the Middle Ages. Jacques de Vitry (Jacobus de Vitriaco c. 1160/70 – 1 May 1240), a French canon regular who rose to prominence, wrote hundreds of exempla (pl.). In the English language, John Donne (22 January 1572 – 31 March 1631) is the author of very fine sermons. But few preachers have empowered their words to the same extent as French bishop and theologian Jacques-Bénigne Bossuet. And sealed the pledge with virgin oath. The translator of La Fontaine’s Site officiel uses the word “dove,” not pigeon. Doves are colombes and tourtelles, turtledoves. In the symbology of love, one uses the word colombe. Doves, colombes and pigeons are columbidae, but they differ from one another. Therefore, the translator of the Musée de France introduces love, romantic love, by using the word colombe, in the title of his translation. As for Walter Thornbury [EBook #50316], he translated the French pigeons using the English pigeons. It is the same word in both languages. But it should be noted that we do not have homing doves, just homing pigeons. By using pigeons, Jean de La Fontaine suggests that his columbidae will return home. He describes the pigeon as a volatile (a bird, noun) FR and volatile (adjective) FR/EN. There is a sense in which literature (non-fiction), speaking animals in particular, always tell, to a smaller or greater extent, that which cannot be told. Anthropomorphism and zoomorphism are effective recourses, but the exemplum, and various displacements (modulations or transpositions) may also be used. In the context of our two pigeons, “L’absence est le pire des maux” seems too elevated a moral. But La Fontaine raises the curtain only to let it fall again. Very few of his poems are specifically lyrical in character, and those few are not among his most typical. It is clear, however, that the power of La Fontaine’s lyricism depends on its displacement into the most surprising contexts. Charles Gounod has set to music verses from Les Deux Pigeons, and so have I (shame on me). Charles Aznavour has composed a song based on La Fontaine’s Deux Pigeons. Apologies. I could not write this post as quickly as I intended. I am not well. Despite the use of the word “for” (pour), it would appear that Jean-Antoine Watteau‘s (10 October 1684 – 18 July 1721) The Embarkation for Cythera (Louvre version) depicts “a departure” from the island of Cythera, the birthplace of Venus. According to Wikipedia, whose sites dealing with our subject have just been maintained, it symbolises “the temporary nature of human happiness.” (See Fêtes galantes, Wikipedia). Consequently, the characters portrayed in The Embarkation for Cythera are not leaving our imperfect world to travel to the land of love, a land resembling Madeleine de Scudéry‘s (15 November 1607 – 2 June 1701), famous carte de Tendre, or map of Tendre. They are returning from Cythera. The term fêtes galantes was adopted by the French Academy in 1717 when Watteau handed in his reception piece to the Académie royale de peinture et de sculpture. It refers to a “courtship party,” such as a masquerade ball that borrowed from the commedia dell’arte. In particular, the term Fêtes galantes refers to the paintings of Jean-Antoine Watteau who died of tuberculosis at the age of 36, in 1721. There had never been paintings such as Jean-Antoine Watteau’s. (See Fêtes galantes, Wikipedia.) Watteau therefore set a trend. Jean-Honoré Fragonard, François Boucher, Nicolas Lancret and other 18th-century artists also depicted Fêtes galantes. It became a favourite subject matter and it fits the reign of Louis XV (Louis quinze). The Embarkation for Cythera is a painting rather than a text. After Watteau, however, Fêtes galantes re-entered literary works and music. The best-known literary Fêtes galantes is a collection of poems by Paul Verlaine, published in 1869. The theme also suffuses Pierre Louÿs’ Les Chansons de Bilitis. Verlaine’s Fêtes galantes were a source of inspiration to composers Gabriel Fauré, Claude Debussy, and Reynaldo Hahn, among others. The term Fêtes galantes has roots in both 17th-century honnêteté and préciosité. As mentioned above, there was, on the one hand, a galant homme. He was an honnête homme and at times a précieux. On the other hand, there was un homme galant or a womanizer. The homme galant, was unlikely to be invited to salons, with the possible exception of persons such as Giacomo Casanova (2 April 1725 – 4 June 1798). In early salons, the main activity of salonniers and salonnières was literature, witty literature. Salonniers and salonnières engaged in “word games,” or the creation of ingenuous little poems. For instance, they would be given the end of lines of poetry to which they had to attach a beginning. These bouts-rimés (rhymed ends), as they were called, demanded inventiveness and substantial linguistic skills. A main characteristic of salon literature, poems mainly, is the use of the conceit (la pointe). However, salonniers and salonnières savoured pastoral romances such as Honoré d’Urfée‘s L’Astrée and heroic romances. Occasionally, they played shepherds and shepherdesses, which were flights from reality, as would be, to a certain extent Paul Verlaine‘s hedonistic and somewhat decadent fin de siècle Fêtes galantes. In other words, despite préciosité, love was a main interest in salons. In fact, to be understood, galanterie must be contextualized. Paul Verlaine’s poems were hedonistic, but they were poems and therefore fictional. There is a Cythera, but Venus is a mythological figure. 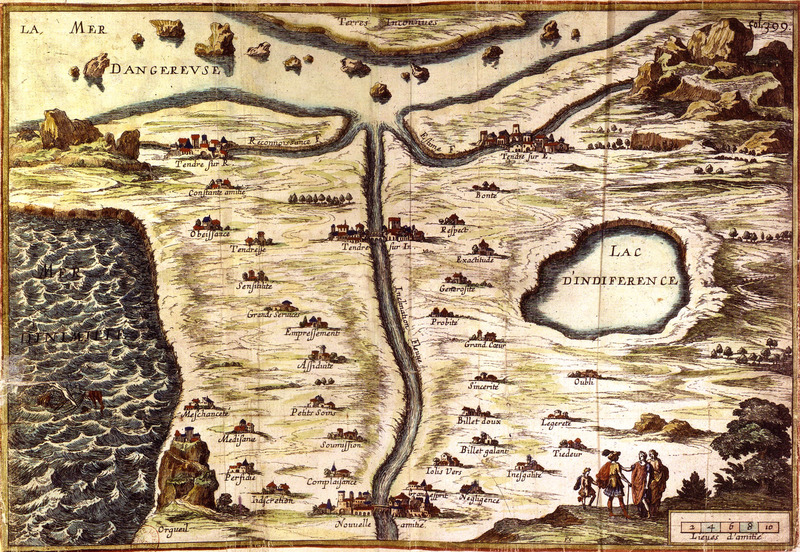 Madeleine de Scudéry‘s (15 November 1607 – 2 June 1701), carte de Tendre, or map of Tendre, published in Clélie, histoire romaine, is a product of the imagination. Yet, préciosité is a moment in the history of love. Précieuses were real women. One instance of précieux love is the fourteen-year courtship Julie d’Angennes FR (1607 – 15 novembre 1671), Madame de Rambouillet‘s daughter, imposed on the Charles de Saint-Maure, duc de Montausier. Here, however, one senses genuine apprehensions: pregnancy, childbirth, and infant mortality. On her 35th birthday, Montausier gave Julie the exquisite Guirlande de Julie a collection of 62 madrigals, but Julie made the Duke wait five more years. This is how “precious” and perhaps frightened she was. They married on 15 July 1645 and, although the Duc de Montausier was an honnête homme and a galant homme, he was un homme. Julie got pregnant and gave birth to a daughter. Préciosité, as mocked in Molière’s Précieuses ridicules (1659), was short-lived. However, as noted above, préciosité or disembodied love is a milestone in the history of love. It belongs to the querelle des femmes, the woman question. It therefore differs from chivalry and the Roman de la Rose, which promoted courtly love without rejecting sexual intimacy. Italian-born Catherine de Vivonne, Marquise de Rambouillet (1588 – 2 December 1665) opened the first salon: L’Hôtel de Rambouillet, rue Saint-Thomas-du-Louvre. Its Catherine de Vivonne called herself Arthénice, an anagram of Catherine. Hôtels were private residences (un hôtel particulier) and salon hostesses received once or twice a week. The hostess usually sat in bed and her guests were in a ruelle, literally and alley way, on a side of the bed. Madame de Rambouillet received in her blue room, la chambre bleue. Occasionally, salonniers and salonnières went on a picnic. That outing was called un cadeau, a gift. When the Marquise closed her salon, Madeleine de Scudéry (15 November 1607 – 2 June 1701) opened hers. Mademoiselle de Scudéry never married. Let us return to Watteau’s 18th-century Fêtes galantes, Jean-Antoine Watteau’s paintings depicting “courtship parties.” (See Fêtes galantes, Wikipedia). In Fêtes galantes personal sentiment is masked by delicately clever evocations of scenes and characters from the Italian commedia dell’arte and from the sophisticated pastorals of 18th-century painters, such as Watteau and Nicolas Lancret, and perhaps also from the contemporary mood-evoking paintings of Adolphe Monticelli. Fêtes galantes are associated with the commedia dell’arte. Actors were, as in ‘to be,’ “masks.” As well, the sad clown is an archetype. Masquerade balls have survived. Balls go back to the ballet de cour. They are courtly and have a counterpart in festivals and carnavals. Charles Sorel, who was named the historiographer of France in 1635, wrote Les Loix de la galanterie, first published in 1644, but galants met and discussed the rules of gallantry. We have several e-copies of Sorel’s Loix or lois de la galanterie. However, despite repeated attempts, I have not found a translation into English of Charles Sorel‘s (c. 1602 – 7 March 1674) Loix de la galanterie. I presume there is a translation, but it is not on the internet. In my next post, I will therefore provide not a translation, but a summary of Les Loix de la galanterie, using Ludovic Lalanne’s text. The terms honnête homme and galant homme are no longer used, nor is the term gentilhomme. The honnête homme is now called a gentleman in both French and English. The word gallant has survived and is used to describe men who still open the door of a car to help a woman out or hold a heavy door when a fragile individual enters or leaves a building or are very polite. The term “grande dame” is used to describe particularly accomplished women, including women who had a salon. Fêtes galantes now belong to the discourse on love refined or “galant,” but love as depicted in Watteau’s ethereal Fêtes galantes. Another version is housed at the Charlottenburg, in Berlin. Calligraphy by Nicolas Jaret. Paintings by Nicolas Robert. A madrigal could be either a song and a poem. “Paul Verlaine”. Encyclopædia Britannica. Encyclopædia Britannica Online. Encyclopædia Britannica Inc., 2016. Web. 22 Apr. 2016 <http://www.britannica.com/biography/Verlaine-Paul>. Salons are often looked upon as a French institution when in fact Italians brought salons to France. However, although the salon was imported, it became a French institution and it never fully disappeared. Gertrude Stein’s home: 28, rue de Fleurus, was a salon. Born in Rome to Jean de Vivonne (marquis of Pisani [1530-1599]) and Giulia Savelli, Madame de Rambouillet (1588-1665), the wife of Charles d’Angennes, marquis de Rambouillet (1577–1652), opened the first famous seventeenth-century French salon. Salons were a gathering place for various distinguished persons: aristocrats of all ranks, cardinals (Richelieu), Louis XIII (at least once), and l’honnête homme, who could be a bourgeois. For the most part, habituées (regulars) were well-educated men and women who shared an interest in literature, philosophy and music. Moreover, they were witty. L’incomparable Arthénice, an anagram of Catherine, established the first and the best of salons and received her guests every Saturday. On fine summer days, they had a cadeau (literally a gift) which was an outing in the countryside: une fête champêtre. Catherine de Vivonne, marquise de Rambouillet, lived in a private house, then called un hôtel particulier, l’Hôtel de Rambouillet, rue Saint-Honoré. But l’Hôtel relocated in 1618. Its new address was rue Saint-Thomas-du-Louvre. Arthénice received her guests in her blue room, la chambre bleue d’Arthénice. She usually sat in bed and her guests, la crème de la crème of French society, gathered in a ruelle (literally a narrow back street), one side of the bed. Bedrooms were very large in the best homes of the seventeenth century and beds were canopied beds featuring somptuous drapes that were drawn closed at night, especially on wintry days. Salons are remembered as places where anything crude was quickly rejected. Only the purest French could be spoken in a salon and one’s manners had to be refined. A male guest was, at the very least, an honnête homme. French galanterie is a sturdy institution dating back to medieval courtly love. It reached a summit in seventeenth-century French salons. However, seventeenth-century salons were not always as they had been at l’Hôtel de Rambouillet. Some salon habitué(e)s were people who made believe they were not what they seemed. The salonniers and salonnières, gave themselves new names and, at one point, the aficionados of salons were so influenced by Guarini’s Il Pastor fido, a pastoral set in Arcadia and published in Venice in 1590 and, later, by Honoré d’Urfée’s L’Astrée (1607-1627), that they played shepherds and shepherdesses (see Pastoral, Wikipedia). Fantasy took over. As well, salons are one of the birthplaces of feminism. Medieval courtly love was revived and revised, and women started looking upon themselves as “précieuses.” They were précieuses, of course, everyone is, but not so précieuses that they could not call a chair a chair. Chairs became “commodités de la conversation.” A comfortable armchair does facilitate conversation, but… Préciosité, was not one of the better moments of la querelle des femmes, the woman question (the term “querelle des femmes” was first used in 1450). In some cases, women kept suitors waiting for several years, before marrying. The Duc de Montausier (1610–1690), courted Julie d’Angennes (1607-1671), Madame de Rambouillet’s daughter, from 1631 until 1645, before she consented to marry him. She was 38 when she married Montausier. The couple had one daughter. Only the finest authors contributed madrigaux to the collection. 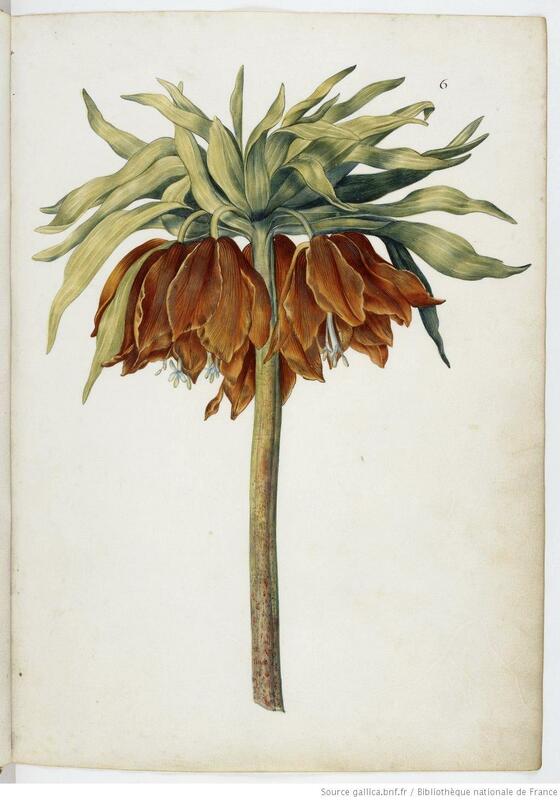 The Guirlande‘s calligraphist was famed Nicolas Jarry and each flower was painted by Nicolas Robert on vellum. It is an illuminated manuscript. The book is now housed at the Bibliothèque nationale de France (BnF) and can be read and looked at online at Gallica BnF. Many can also be seen at Bridgeman Images. Bridgeman Images: illustrations of most of the flowers painted for Julie. Other than polite and witty conversation, the main activity of salonniers and salonnières (salonists) was writing. They had been influenced by Giovanni Battista Guarini’s (1538-1612) Il Pastor Fido (1590), a pastoral tragicomedy, and Honoré d’Urfé’s L’Astrée (1607-1628), a lengthy novel featuring shepherds and shepherdesses living in bucolic settings resembling Il Pastor Fido‘s Arcadia. Salonniers and salonnières wrote abundantly and love was their favourite topic. 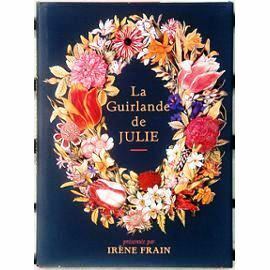 Among the books they wrote, we know about La Guirlande de Julie. 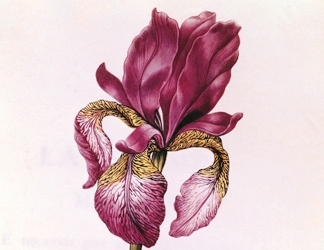 It was a gift to Julie d’Angennes, Madame de Rambouillet’s daughter, and contained sixty-two madrigals each of which compared Julie to a flower. According to the rules of Préciosité, a movement born in Salons, women looked upon themselves as precious or précieuses. Moreover, Préciosité had banished unrefined behaviour, in general, and unrefined courtship, in particular. So the Duc de Montausier courted Julie d’Angennes for fourteen years before she consented to marry him. This map was included in Mademoiselle de Scudéry’s novel: Clélie. Moreover, as we will now see, love was subjected to various rules. For instance, Madeleine de Scudéry (1607-1701) described the towns, villages and rivers of her Arcadia, called Tendre. A map of the pays de Tendre was actually designed. It was probably drawn by François Chauveau (1613-1676). Madeleine de Scudéry (1607-1701) had been a member of l’Hôtel de Rambouillet, the first famous salon of seventeenth-century France. But as the Marquise de Rambouillet grew older, salonniers and salonnières started to gather every Saturday at the home of Madeleine de Scudéry whose pseudonym was Sapho. Thus was born the Société du samedi (Saturday Society). It flourished during the second half of the seventeenth century, called le Grand Siècle (the Great Century), the age of Louis XIV (1638-1715), the Sun King. Sapho was well educated and a prolific writer. Madeleine de Scudéry’s longest work is Artamène, ou le Grand Cyrus (10 vols., 1648–53), but la Carte de Tendre was featured in Clélie (10 vols., 1654–61). Clearly outlined on the Carte de Tendre are three forms of love each depicted as towns on the side of three rivers: Inclinaison (inclination), Estime (esteem) and Reconnaissance (gratitude). So love had three forms: inclinaison, estime, reconnaissance. There were villages along the way, all of which were allegorical: Jolis-vers (lovely poems), Billet-doux (love letter) and others. If lovers allowed themselves to enter untamed passion, they sailed on a dangerous sea, called Mer dangeureuse. However, if passions were restrained, love could be a source of happiness. Interestingly, although she had a gentleman-friend, Paul Pelisson, Mademoiselle de Scudéry never married. As may be expected, Mademoiselle de Scudéry’s Carte de Tendre was satirized. In fact, Molière (1622-1673) wrote his first Parisian play on the Précieuses: Les Précieuses ridicules (1659). By 1659, the Précieuses had much too high an opinion of themselves. 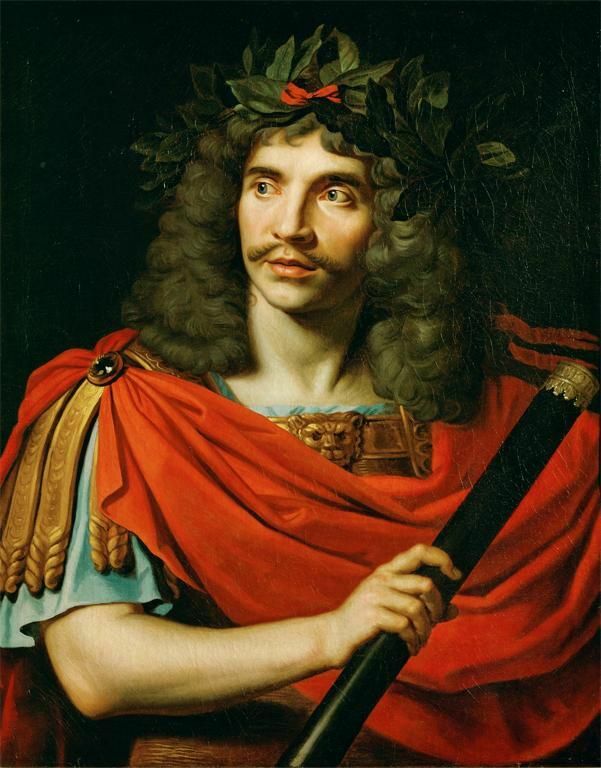 Molière’s comedy was a slight blow to the movement, but the one-act play was a great success and Molière went on to bigger and better things, including a personal friendship with Louis XIV. Passions were abundantly discussed in seventeenth-century France. Both Descartes and Pascal contributed a treatise on passion. Descartes wrote a treatise on the Passions de l’âme (The Passions of the Soul) and Pascal, a Discourse on the Passion of Love. However, passionate love was never so dangerous than in Madame de La Fayette’s La Princesse de Clèves (1678), a psychological novel in which love is viewed as a source of endless pain. It feeds on jealousy as does Phèdre’s love for Hippolyte. Interestingly, dramatist Jean Racine‘s (1639-1699) Phèdre, a tragedy, was first performed in 1678, the year Madame de La Fayette (1634-1693) published, anonymously, La Princesse de Clèves. The world that followed the French Revolution was a new world, but it had kept many of the institutions of the Old World, or l’Ancien Régime. One of these institutions was the salon. 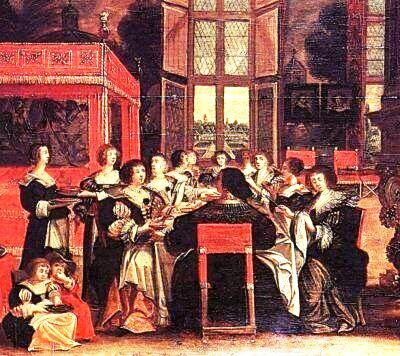 The first known French salon was seventeenth-century Catherine de Rambouillet’s Chambre Bleue. Guests enjoyed making believe they were shepherds and shepherdesses and they wrote poems, at times very tricky ones. La Chambre bleue was a magnet. Even Richelieu was inspired to visit. In the middle of the seventeenth century, Catherine de Rambouillet‘s salon was replaced by Mademoiselle de Scudéry‘s. Mademoiselle de Scudéry was a prolific writer and her favourite subject was love. She drew the map of Tendre, Tendre being the land of love. In the eighteenth century, the Golden Age of the salon, the most famous was Madame Geoffrin‘s (June 1699 – 6 October 1777). Dignitaries visiting Paris were infinitely grateful for being invited. It was such a privilege, but salons were not as they had been in the seventeenth century. The French eighteenth century was the Age of Enlightenment, so ideas were discussed. On Monday, Madame Geoffrin received artists and, on Wednesday, men of letters. Ideas were discussed, but never too seriously. That would have been a breach of etiquette. L’honnête homme and the Encyclopédistes were a witty group. All were treated to a fine meal. However, even at Madame Geoffrin‘s salon, love remained a favourite subject. After and even during the French Revolution, except for the “Reign of Terror,” people, gentlemen mainly, flocked to salons such as Madame Récamier’s and Madame de Staël‘s. It is also at that time that François-René de Chateaubriand and Madame de Staël (22 April 1766 – 14 July 1817) inaugurated French Romanticism, a literary movement that gave primacy to sentiment. Goethe‘s Sorrows of Young Werther (Die Leiden des jungen Werthers) was published in 1774, so France lagged behind both German and English Romanticism. François-René de Chateaubriand would soon publish René and Atala, novellas included in his Génie du christianisme, or Genius of Christianity (1802). It fact, although he is not included in David’s portrait of Madame Récamier, chances are Chateaubriand is looking at the “divine” Madame Récamier. In the early 1800’s, Chateaubriand was the most prominent author in France and Madame Récamier’s finest guest, but as he grew older, he lived like a recluse in a Paris apartment and visited one person only, Madame Récamier, Juliette. As for Germaine de Staël, a prominent theorist of Romanticism, Napoleon often banished her from France, causing her to spend several years at Coppet, her family’s Swiss residence. She was the French-born daughter of Swiss and Protestant banker James Necker, Louis XVI’s director of finance. Finding a husband for Germaine was not easy. Her father did not want her to marry a Catholic. Although she lived in the company of men who were fascinated by her extraordinary intellectual gifts and charm, most could not be serious candidates because Frenchmen are Catholics. She therefore married baron Erik Magnus Staël von Holstein, a Swedish diplomat. It could be said that Chateaubriand and Madame de Staël founded French Romanticism, a literary movement that spread to the fine arts and music. She is the author, among several books and treatises, of Delphine (1802) and Corinne (1807), novels. But her most fascinating work is De l’Allemagne, or Germany (1810-1813). It is, to a large extent, a manifesto of Western European Romanticism. She discussed L’Allemagne with her excellent friend and lover, Swiss-born novelist Benjamin Constant, or Henri-Benjamin Constant de Rebecque (25 October 1767 – 8 December 1830), a descendant of Huguenots (French Protestant Calvinists). Hugo also brought back things medieval, which he did with Notre-Dame de Paris or The Hunch Back of Notre-Dame. Chateaubriand felt seventeenth- and eighteenth-century French literature was somewhat borrowed, which it was. French authors emulated the Anciens or Greco-Roman literature. In cafés, however, men of letters discussed more freely. Cafés had become popular in the seventeenth century. Le Café Procope, established in 1686, has never closed shop except for occasional renovations. During the French Revolution, Chateaubriand spent 10 years outside France. For one year he was in the United States and then joined an émigré army at Coblenz, Germany. By and large, years émigrés spent abroad were disruptive. Madame de Staël enjoyed diplomatic immunity in Paris as the wife of Sweden’s ambassador to France. However she lived in England in 1893-1894 with her lover Louis de Narbonne, an émigré. She returned to Paris, via Coppet, her family’s Swiss residence, as soon as the Terreur was over, in the summer of 1794. She was a successful salonnière under the Directoire (1795-1799), a government toppled by Napoleon’s 18 Brumaire, Year VIII (9 November 1799) coup d’État. She fared poorly under the Consulat, with Napoleon as first Consul. He banished her for nearly a decade but could not prevent her from thinking and writing. Coppet was a beehive. I still enjoy reading Madame de Staël’s De l’Allemagne. The French Revolution deprived France of tens of thousands of its citizens. But, somehow, tens of thousands survived as did the institutions, salons and cafés, where they congregated to discuss such ideas as liberté, égalité, fraternité. 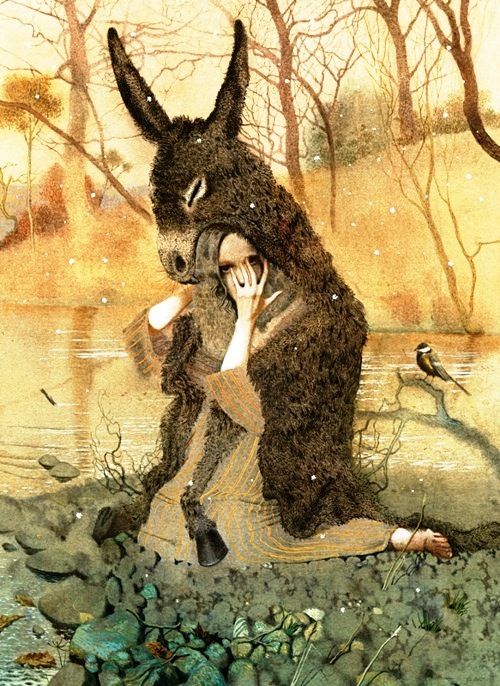 Animals play many roles in literature. 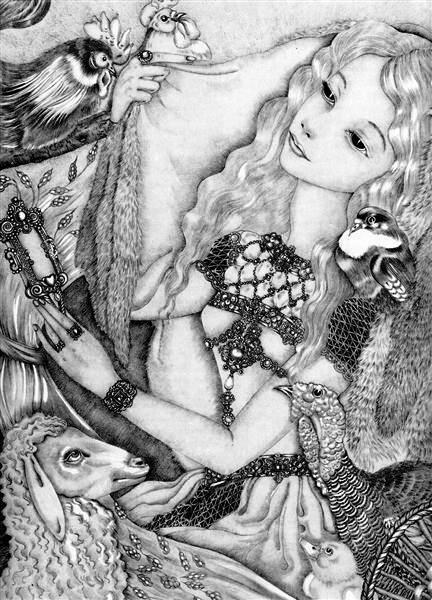 We have seen them in fables, beast epics, bestiaries, and high fantasy literary works, but we haven’t looked at animals inhabiting fairy tales. By and large, in animal fairy tales, a witch, or a fairy godmother has transformed a prince or a princess into a frog or a toad. Usually, if three conditions are met, the curse is lifted and there appears a prince or a princess. There are exceptions to this scenario, yet it remains a common narrative. However there are other narratives. 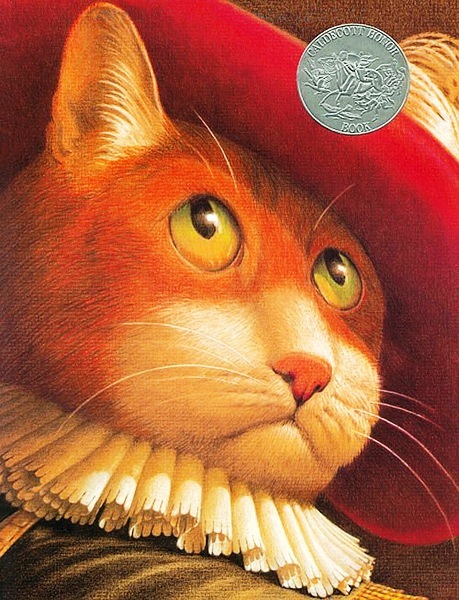 For instance, we have magical cats, and our best example is Charles Perrault’s Puss in Boots. In Puss in Boots, the protagonist, or main character, is the third son of a miller. One of his brothers has inherited the mill, the other a donkey, but Puss’ master has inherited a mere cat, nothing more. His fate could be worse. He’s not a prince who has been turned into a frog or toad, but he feels he has been cheated. However, proud Puss does not consider himself an inferior inheritance and sets about to take his master from rags to riches. Puss in Boots has made earlier appearances in Giovanni Francesco Straparola (c. 1480 – c. 1557). Straparola is considered the father of the literary form of the fairy tale in Europe, but fairy tales constituting Charles Perrault‘s Tales of Mother Goose (1697) are the versions we know and belong to literature. Between 1550-1555, Straparola wrote Le piacevoli notti or The Facetious nights. To recapitulate, although Puss in Boots may date back thousands of year, the immediate known sources of French 17th-century fairy tales are Italian. However, these fairy tales could not be told to children, unless they had been translated and refined to meet the expectations of salonniers and salonnières (see Salons, Wikipedia). Charles Perrault’s Puss in Boots is a well-written Puss in Boots, a product of late seventeenth-century French salons. As we know from earlier blogs, Charles Perrault had worked at Versailles, he was an habitué of salons and a member of the French Academy. The third son of a miller is disappointed because all he has received as his inheritance is a cat. However, he will soon know otherwise. First, Puss asks the third son to provide him with a sack and with boots. Deep within the human psyche lies the wish to travel quickly and, particularly, to fly. In Puss in Boots, no one has wings. But fairy tales also feature magical boots called bottes de sept lieues, or seven-league boots. They allow extraordinary mobility. It could be therefore that Puss has been provided with bottes de sept lieues, but I doubt it. The boots seem a prop befitting the genre, a signature. Puss does not need them, except to appear human. Yet, Puss does put on the boots, but what he shows is exceptional ingenuity, which is a characteristic of Reynard the Fox who succeeds in talking himself out of a death sentence. As for Perrault’s Puss in Boots, he starts killing game, putting it in his sack, and offering it to the King on behalf of a his renamed master. Puss has therefore transformed the third son a miller into the Marquis de Carabas. But this is not an instance of metamorphism, but one of ingenuity. It is Puss, a clever cat, and not a fairy godmother, who has turned the third son of a miller into an aristocrat. 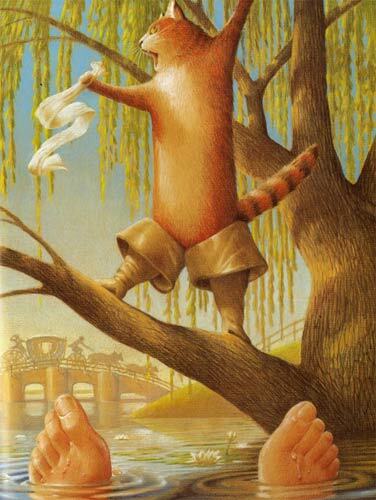 Next, when Puss in Boots hears that the King and his daughter will ride along a river, he asks the new Marquis to get into the water. He then screams out that the Marquis is drowning. So the King stops, the Marquis de Carabas is saved, he is given appropriate clothes, and the King’s daughter falls in love with him. Clothes make the man. Puss then reflects that a Marquis has to be a landowner. He sees peasants mowing a meadow and does so at the right moment: kairos – explained further down – and asks them to tell the King, when he passes by, that these fertile fields are the property of the Marquis de Carabas. Puss uses a ruse worthy of Reynard, the cunning fox. Puss in Boots and the Marquis de Carabas then come to a castle, kairos as opposed to chronos. In this castle, resides the landowner: an Ogre. This Ogre claims he can transform himself into other animals and, to prove it, he turns himself into a lion. Puss being very clever quickly asks the Ogre to turn himself into a mouse. The Ogre, who is not very clever, does as he is asked and Puss in Boots eats him up. Just then, at the opportune moment, kairos, the King happens to come to the beautiful castle. The moment is in fact all the more opportune since the Ogre has a banquet ready for guests. When the Ogre’s guests arrive and see the King’s carriage, they flee. Consequently, a banquet is ready for the King. The King is so delighted with the events of the day that he tells the Marquis de Carabas that if he, the Marquis, says the word, he, the King, will take him for his son-in-law. So, after renaming his master and three ruses: the river, the land, the castle, the third son of the miller has become a rich landowner who lives in a beautiful castle, and will marry the King’s daughter. Fairy tales end as comedies do. There is a marriage. The banquet is the dénouement or outcome. Note that the number three is important. The miller has three sons. As for events, the first could be the river, the second, the ruse concerning ownership of the land, and the third, the acquisition of the castle. But the first could also be renaming the third son of the miller, except that renaming his master perhaps encompasses the three events, or the name of the strategy. Moreover, it should be pointed out that, in Ancient Greece, time was seen in both its vertical, kairos, and chronological, chronos, dimensions. Æon (Latin for the Greek word koine) was time eternal, which was sometimes represented by the same figure as chronos. In Buss in Boots, as in most fairy tales, things are there when they are needed and events happen at the opportune moment. That is kairos, time in its vertical dimension and time which could be called magical. We have finally shed light on the word kairos. It is also true that the Ogre can transform himself, which is the stuff of fairy tales. But Puss in boots can’t. Puss is not an Ogre, he is simply very smart and resourceful. And it is because of these qualities that Puss can be considered a magic wand or fairy godmother, which gives this one fairy tale a lovely new twist. [i] I am using Malcolm Arthur’s translation of Le Chat botté, illustrated by Fred Marcellino (Farrar Straus Giroux, 1990).